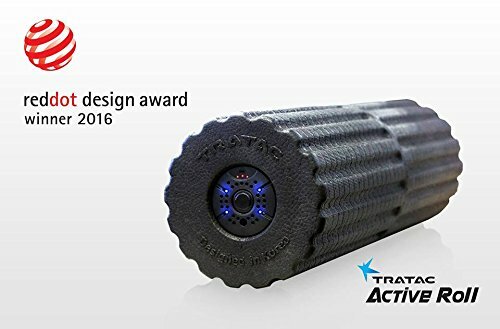 With different intensities of vibration, Tratac Active Roll is a piece of equipment that offers the benefits of a sports massage while improving a person’s stretch, balance and core muscle strength – whether in the gym, at home or at a rehabilitation clinic. The specially grooved surface of cross stripes in-creases blood circulation by stimulating the area being massaged. The expanded polypropylene is a durable, light and recyclable plastic foam material with excellent energy absorption. 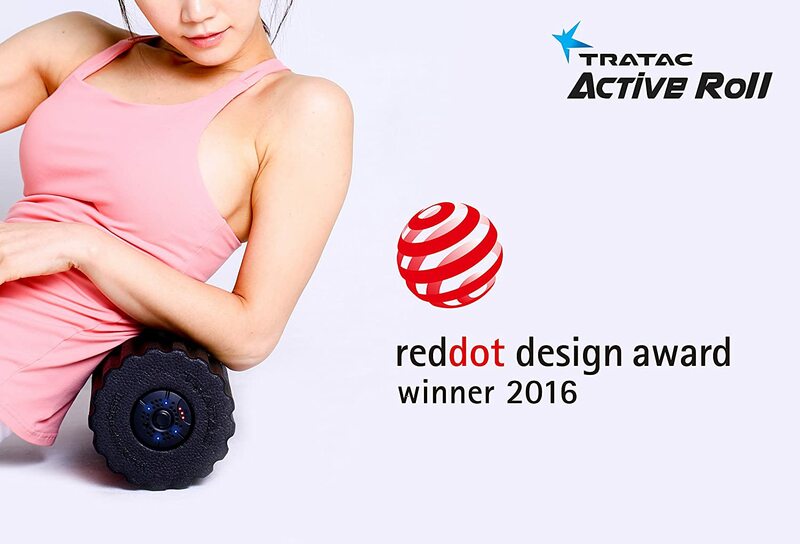 Different features of Active roll vs other foam rollers. 1. Vibration helps A LOT for whom they can’t pose and roll properly because it massages the body just by touching it. 2. Newest core structure – built in a FAN to air out the temperature that motor creates to keep motor in a good environment when it’s working in such high frequency. 3. Active Roll can work in LOW rpm without any noise problem when other competitive products struggle. 4. Active Roll Uses a smaller motor that only requires 2 cell batteries when others need 4. It uses a smaller motor but this makes the roller not only lighter but also easier to carry around and still provides the same vibration quality with others or even stronger. It is like having 3 devices in one: a foam roller, a TENS unit, and a massager. The "foam" part is made of a hard rubber, not as hard as a car tire, but not soft either. A regular foam roller when they first came out, was smooth and made of a hard foam. So it basically had one major use for it. The grid-like areas help get into those tough spots to address trigger points, depending on how you position your body over it. This foam roller not only allows you to address trigger points from a wide spread area, but also more concentrated areas because of the pattern of the grid. There are 4 levels of vibration on this roller. The vibrational frequencies are at 20-80 Hz. My body personally feels the best using Levels 1 & 2 and this for me seems to stimulate healing quicker. All of these frequencies is what you would find with an average TENS unit. A TENS unit helps stimulate endorphin and seratonin production, which help with pain relief, healing, making you feel better overall. Level 1 - 2 seems to help me more with chronic pain. Level 4 seems to help with acute pain. How am I using it now? I use it after my workouts/exercise (weightlifting, cardio, HIIT, walking, karate, resistance band training, KB training, etc) on my whole body - quads, hams, glutes, hips, chest, stomach, IT bands, calves, shins, heels, feet, all over back, lats, tris, bis, forearms, behind knees, ankles, wrists, shoulders, traps. The only areas I wouldn't really use are the neck and head because I have some motion sickness issues and even at the lowest level, it made me feel sick. You can roll it with the vibration or you can roll without vibration or you can have it stationary. I found it's most effective AFTER a workout while your muscles are warmed up, but it's also good if you use without doing a workout. I am also using the Active Roller to help me with mobility type exercises and I think it's a great tool for that. Rather than having to buy several tools that could easily cost a few hundred, all this is wrapped up in this roller and it's great. Though the price of the Hyperice Vyper has come down, because of the reviews I read on that with often not having great customer service, I went with the Active Roller because sometimes things do go wrong and you want the company to be positively responsive to address the issue. The Active Roller also holds a charge for quite some time. I've only had to charge it a few times since I've gotten it and maybe the average use of it per day is about 15 minutes. I haven't tried to see how long it will go before it doesn't work and I have to recharge. I believe since I charged it, it was about 7-8 days ago. Physical impressions of the device: It is solidly built. If you set it on the floor or carpet the thing will "crawl" around--pretty neat. I rolled this thing between my shoulder blades with my whole body on it and my feet, and it didn't flinch. I'm seriously impressed now. I then did the soles of my feet, putting heavy weight to keep it from vibrating away, then my whole body. For each area I had to roll up, down, up, down, over and over again. The time and discomfort are why I hate foam rolling, no matter how much it serves to protect me from injury. With this jewel, I was able to hit EVERY spot with practically no pain or discomfort. My typical pain spots were....NOT!!!! All I could think of is that the vibration, along with doing what vibration does to the muscles, fascia, and neuroreceptors, also effectively overwhelmed the pain sensing nerves (nociceptors). This kind of overwhelming the sensory input so that pain is dampened or erased is exactly how TENS units work. So I say again: Rolling with the Active Roller was PAIN-FREE, and took only one pass for each area. To test if the rolling actually worked because I'm so conditioned to expect nothing without pain, I just rolled myself on my regular roller, and lo and behold, I had almost no tender spots left. And by tender, I mean hypertonic, hypersensitive areas of muscle that are pathological (not good). I am so very sold on this device, and am looking to see if there is any formal research coming out. Current research (Brunetti et atl, 2006) has shown dramatic and long lasting improvements in strength and balance, both often severely compromised after surgery, from local application of 100 Hz vibration for 10-15 minutes after surgery. This device is clearly lower in frequency, and probably less effective as a sensorimotor / proprioceptive activation device, but its frequency definitely covers that of the pain sensors based on my experience.